Copper can be produced as either a primary product or as a co-product of gold, lead, zinc or silver. In the Copper Ore Processing Plant, It is mined in both the Northern and Southern Hemisphere and primarily consumed in the Northern Hemisphere with the U.S. as a primary producer and consumer. The copper processing plant industry refines copper from metal ores or scrap copper. The leading consumers of copper are wire mills and brass mills, which use the copper to produce copper wire, etc. End uses of copper include construction materials, electronic products, and transportation equipment. Copper is mined in open pits and below ground. The ore usually contains less than 1% copper and is often associated with sulfide minerals. The ore is ground, concentrated, and slurried with water and chemical reagents. Air blown through the mixture attaches to the copper, causing it to float to the top of the slurry. SBM has set the whole copper ore processing plant in Indonesia, Canada, Zimbabwe, Turkey, Chile, Zambia, Philippines, USA, Tanzania, Nigeria, South Africa, Iran, Pakistan, UK and New Zealand. 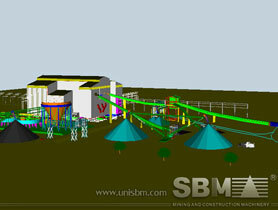 From mining process to the beneficiation process, copper concentrate process, SBM can design copper processing flow chart for the copper ore mine production plant. "With SBM MTW trapezium grinding mill we find it is easy to earn both high profit and low consuption."